If you are looking for a powerful Retinol Moisturizer Cream, then I think you have found it! 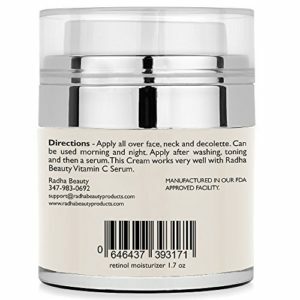 With 2.5% active Retinol (vitamin A), along with vitamin E, hyaluronic acid and green tea (powerful antioxidants), the Radha Beauty Retinol Moisturizer Cream helps to combat fine lines and wrinkles, reduce mild acne and hyper-pigmentation, and give your skin a more youthful and healthy glow. Aids in cellular repair and cell regeneration. Protects and fights against UV damage. Free from parabens and other harmful ingredients. 71% organic and natural ingredients. If you want to add a potent moisturizer to your daily beauty regime, then the Retinol Moisturizer Cream by Radha Beauty is definitely worth investigating. This retinol cream comes in a 1oz (30 ml) jar and has a pump action delivery system for easier application. It is free from parabens, alcohol, sulfates, phthalates, synthetic fragrances and dyes, not tested on animals and is made in an FDA approved facility in the USA. Retinol is a natural form of vitamin A, which helps to reduce fine lines and wrinkles by boosting the production of collagen in your skin. It also increases the turnover of cells in your skin, unclogs blocked pores, reduces the size of your pores and helps to heal mild forms of acne. The Radha Beauty Retinol Moisturizer Cream contains Cassia Angustifolia Seed which is the botanical from of hyaluronic acid. This ingredient is known as a super hydrator, because it penetrates the top layers of your skin and delivers moisture exactly where it is needed. Hyaluronic acid is also essential for the production of collagen, and as we age we lose a lot of the hyaluronic acid in our skin, resulting in a loss in collagen as well. Replacing the hyaluronic acid in your skin gives your skin a smoother, softer and more defined appearance. Aloe Vera is an old remedy and is fabulous for healing your skin, particularly sunburn, inflammations and mild forms of acne. It also moisturizes your skin, and helps to reduce fine lines and wrinkles and aids in cellular regeneration. Vitamin E is a very strong antioxidant and has long been used in moisturizers, as it helps to reverse the effects of UV damage and protects our skin from any further damage. As an antioxidant, vitamin E also helps to minimize mild problems with hyper-pigmentation, such as skin spots and age spots. Jojoba oil contains wax esters that resemble the sebum in our skin, helping to lock in our skin’s moisture. As we age, the amount of these wax esters in our skin reduces, which is one of the reasons why our skin looks and feels much drier and less youthful. So adding Jojoba oil to your skin helps to replace these esters, giving your skin back its natural protection against drying out. 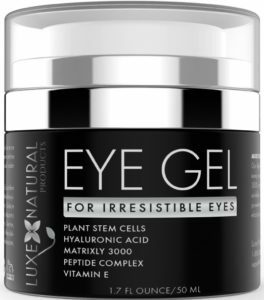 It is also packed with vitamin E, helping to prevent damage from free radicals, assisting in cellular repair and brightening your skin. Green Tea is another powerful antioxidant that heals skin irritations, soothes your skin and helps to fight against damage from UV radiation. So if your skin has been damaged by the sun, green tea is a fabulous ingredient to have in your moisturizing cream. Sunflower Oil contains vitamin E and other essential fatty acids to help nourish and moisturize your skin. it also helps to fight against free radical damage and protects your skin from further damage. 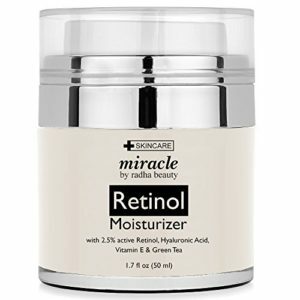 How does this Retinol Moisturizer Cream work? Active retinol is simply vitamin A, which is an extremely effective ingredient in reversing the signs of aging in your skin due to UV damage. It has also been shown to improve fine lines and wrinkles in skin that has naturally aged, helping your skin to remain hydrated and increasing the production of collagen. The other main ingredients in this moisturizing cream are high in antioxidants, which also packs a punch by helping to fight free radical damage from too much exposure to the sun and reducing hyper-pigmentation problems, such as age spots or sun spots. The result is that your skin is super hydrated, feels and looks smoother and softer, more youthful, brighter and fresher. How do you use this Retinol Moisturizer Cream? You can use this Retinol Moisturizer Cream on both your face and on your body, but it is important to remember to always use a sunscreen when you use any skincare products that contain retinol, because your skin will become more sensitive to the sun. This retinol creme can be used twice daily and the best effects will be achieved if you apply this cream just after showering. This is because your skin absorbs your skincare products more easily just after bathing or showering with warm water (you won’t have the same effect after a cold shower!). If you use this retinol cream on your face, just use one pump of the cream and then massage the cream into your face and neck areas. If you use it on other areas, you might need to use more than one pump, depending on where you apply this cream. You can follow up with the Radha beauty Vitamin C Serum for maximum protection against UV damage to your skin. There is no denying that customers love this retinol moisturizing creme with around 4000 online reviews from happy customers. This moisturizer is incredible. I absolutely love it!! I have also been using the rose hip oil, and recently ordered the Vitamin C Cleanser. I really am obsessed with Radha Beauty products and plan to order more products. My skin has never been better. Love this stuff! I have sensitive skin and this does not bother me at all. I bought this and the Vitamin C Serum and use both morning and night. Oh my, what a difference in just two week! Love it! It comes in an easy to dispense container, isn’t greasy, and leaves my skin feeling soft and smooth. I absolutely love the retinol moisturizer! It works great with the Vit C serum. I have noticed an improvement in my skin after just a couple of weeks! I have been using for a few weeks now and have noticed my skin is a lot more moisturized but brighter too. My smile lines are not as prominent. I like it. I was skeptical about it. But after a week of using it, I really like it. I do see less visible lines around my mouth. 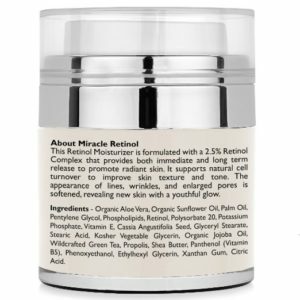 This is a non-greasy retinol moisturizing cream that absorbs really well into your skin and improves the texture of your skin, reduces free radical damage, softens fine lines and wrinkles and reduces acne scars. It is also at a very good price point and will make an excellent addition to your daily beauty routine. Read more of my featured reviews here. « Is your Hyaluronic Acid Serum Too Drying?